Seattle-based grunge legends Pearl Jam are one of the few bands out there that could rest on their laurels and carry on without realising new material, especially with classic albums such as Ten, VS and Vitology under their belt. 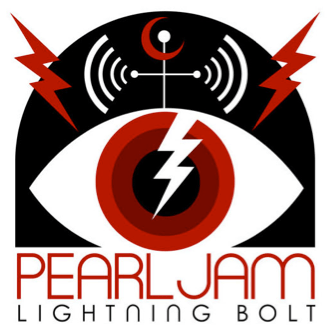 However, Lightning Bolt is a world away from classic Pearl Jam, continuing the more classic rock oriented sounds of the past few albums rather than the genre defining grunge that made them popular. Not to say this is a bad thing, there’s some really quite brilliant songs on this album. The opener ‘Getaway’ gives off an almost Rolling Stones like vibe with its swaggering guitar work and grooving rhythm. The aggressive first single ‘Mind Your Manners’ – featuring some fantastic drum work from Matt Cameron, also of Soundgarden – and the bass heavy ‘My Father’s Son’ begin to show signs of the Pearl Jam we all know and love while still sounding modern and relevant. The ballad ‘Sirens’, while showcasing Eddie Vedder’s fantastic singing ability, lowers the momentum of the album slightly, only for it to be raised again by the anthemic title track. At this point, however, it becomes clear that the band have wanted to make the difference between the A side and the B side of the album noticeable, with the raging hard rock of the first half being replaced by slower, more reflective songs. The bongo led ‘Pendulum’ almost sounds like a Peter Gabriel song, and the bouncy ‘Swallowed Whole’ resembles classic Bruce Springsteen. It is at this point in the album, however, that the shining moment occurs: the song ‘Let The Records Play’ is in a more bluesy style, resembling artists such as Howlin’ Wolf and Muddy Waters instead of The Who and The Rolling Stones. Surprisingly, it works. Obviously the anthemic choruses are still present, but the heavy riffs have been replaced by sleazy blues chords and blistering guitar solos. It’s a shame there’s not more of this on the album, really. The last three songs are a bit of a let-down after that, with two acoustic ballads and a piano led tear jerker rounding out the album. Lightning Bolt doesn’t really gain enough momentum to keep it interesting, and, due to the last three tracks, it goes out with a whimper rather than a bang. That being said, when the album is good, it’s very very good, and aforementioned ‘Let The Records Play’, alongside the first five tracks, will make fine additions to their live set. Maybe, just maybe, if the next album is of similar quality of these songs, they can escape the shadow of Ten.